Straw bale gardening is container gardening and raised bed gardening rolled into one, where the straw bales serve as the container as well as the growing medium. You simply stack bales of straw and plant in it. The straw gradually breaks down by the elements and time, with the additional help of plant roots and extra moisture that comes from regular watering. 1. Grow your plants anywhere – It is suitable for any zone and climate. It has been tried in the tropical areas and places that fall within the Arctic Circle. In places with short growing seasons, straw bale gardening helps extend the season by a week or two both at the start and before winter sets in. 4. No need to till the land – Straw bale gardening is ideal for those who love growing but hate tilling. You don’t have to so much as break the turf. 5. No need to transport soil and compost – Lugging large quantities of soil and compost to make enough beds to grow veggies is both heavy work and expensive. Straw bales are light, they come in neat bundles, they are easy to shift and move around. You need only very small amounts of compost for starting the plants in straw bales. 7. Does away with containers and construction of raised beds – You don’t need to invest in containers or wooden planks for constructing raised beds. Straw bales are much cheaper. Although you need to get new ones every season, they are completely recycled at the end. Straw bale gardening almost seems like magic, but there’s a method to it. Straw has always been used in garden beds as winter mulch and sometimes as a substrate for growing certain types of mushrooms. But Joel Karsten is credited with developing straw bale gardening as a feasible technique for growing veggies and popularizing it with his book Straw Bale Gardens. You need a regular supply of water to keep your straw bale garden flourishing. Straw conserves water, so the total water requirement may be lower than you’d need for growing the veggies in the ground, but you should ensure a regular supply. The straw bales may provide a steady supply of nutrients to the plants as they slowly decompose, but it may not be sufficient to support a large number of plants. You can use any type of fertilizer as you would normally use in regular gardening. Overuse should be avoided, though. 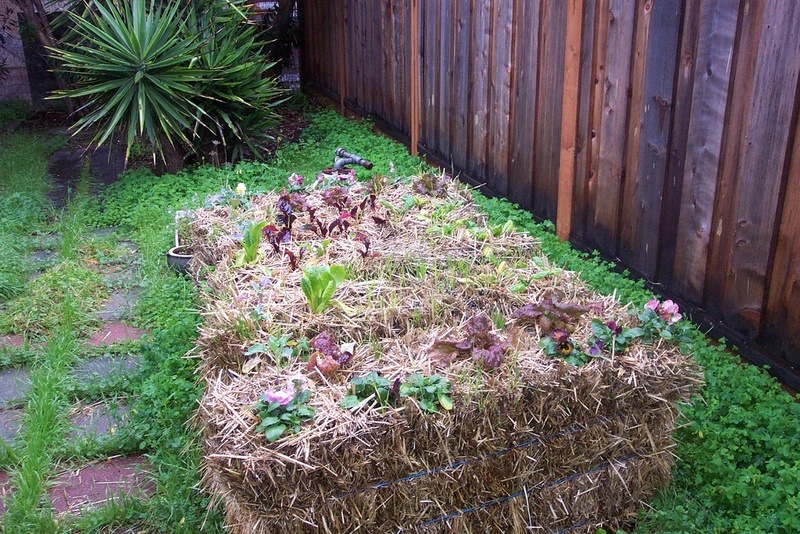 Arrange the straw bales where you want your garden to be. An unevenness of terrain or poor soil need not be a concern when you use straw bales for growing the plants. The only things you should ensure are plenty of sun and water that all plants need for good growth. Straw bales are ideally placed with the cut ends of straw facing the sides. Straw bales need to be conditioned to make them suitable for growing plants. There are two main reasons. When exposed to the elements, straw bales undergo natural decomposition as all organic materials do. The breakdown process is exothermic; it releases lots of heat as in compost piles. You don’t want your seeds and seedlings to get cooked. Typically, small holes are made in the straw bales for planting. You can do it by either moving the straw aside or removing some. This is called pocket method, where each pocket should be 3 to 4 inches deep. Use finished compost or well rotted manure to fill the pockets. Flat bed method is a variation in which 2 to 3 inches of compost is evenly spread on the bales. Pests and diseases are much rarer in straw bale beds than you encounter in regular garden beds. Since the plants grow far removed from the soil, nematodes and other pathogens in the soil do not affect the plants. Since new straw is used every season, there’s very little risk of bacterial and fungal spores starting infections or carrying them from season to season. However, beware of undesirable organisms reaching your beds through compost and manure you add to the beds. You can grow a mixed bag of veggies to cater to your needs and to make the best of your straw bale gardening. Almost any type of veggies and fruits that you raise annually can be planted, but it may not be a bad idea to avoid large plants like corn or big, spreading pumpkins. Straw bale gardening is most commonly used by farmers for producing food, lots of it, with minimum effort and expense. But that doesn’t mean you cannot adapt it for ornamental gardening. Gardeners often grow marigolds and some other flowering plants on the straw bales for pest control and for attracting pollinators. Planning a flower and foliage garden exclusively around straw bales is a personal choice, but you need to address the aesthetic concerns involved. Planting the sides or using props may help mask the bales. A good gardener wastes nothing. Straw bales after a season’s crop may not be suitable for another season, especially in places where warmer temperatures and rainfall break down the bales at a faster rate. The straw can be used as mulch elsewhere in the garden or use it to line walkways. Previous post: Take THIS First Thing In The Morning And Burn Calories All Day!